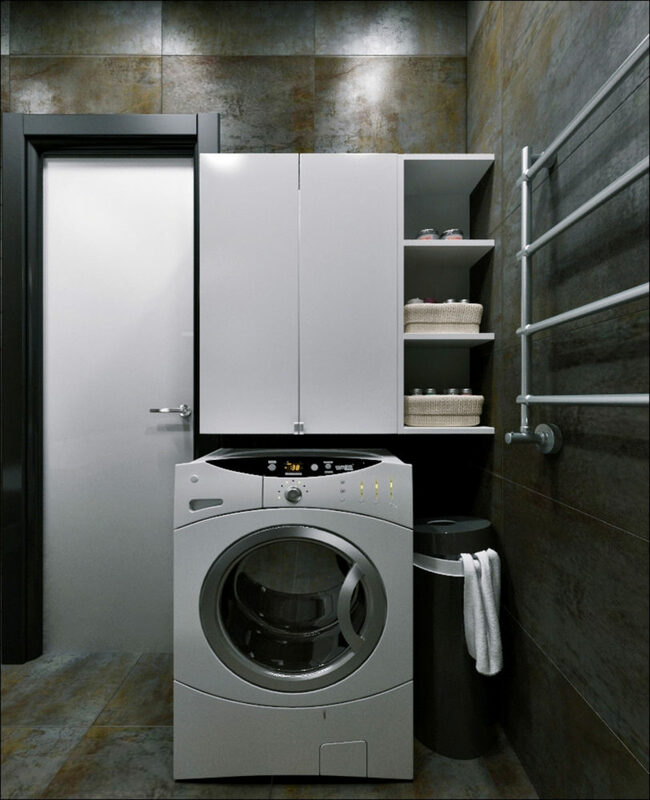 It turns out that for real professionals in theirIn fact, an area of ​​40 square meters. m is not so little, and you can always find profitable solutions for registration. 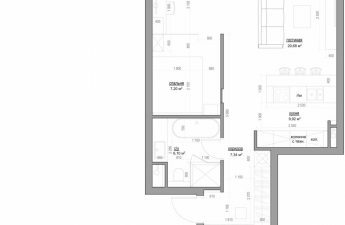 If the right and rational approach to this issue, then you can find a place for everything you need, but with the help of a properly selected color and layout there is an opportunity to work with the size of the room. About unique solutions and techniques will be discussed in this article. 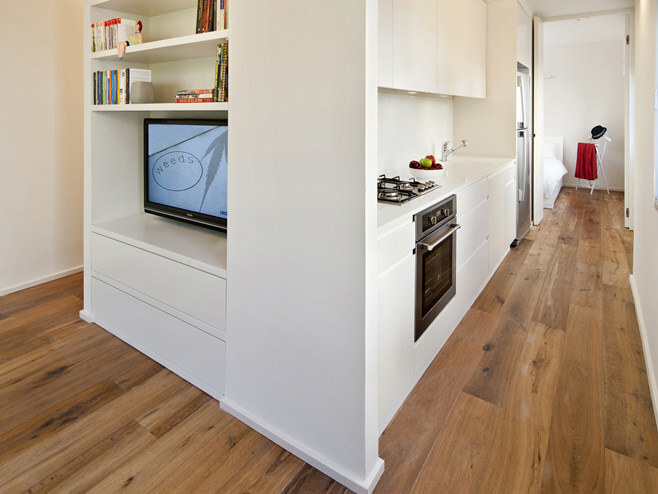 The client wished the sleeping area to beisolated from the rest of the apartment, and had everything necessary for cooking and disposed to a pleasant tea party. The design of the living room should be attractive so that it is comfortable to sit in it with friends. 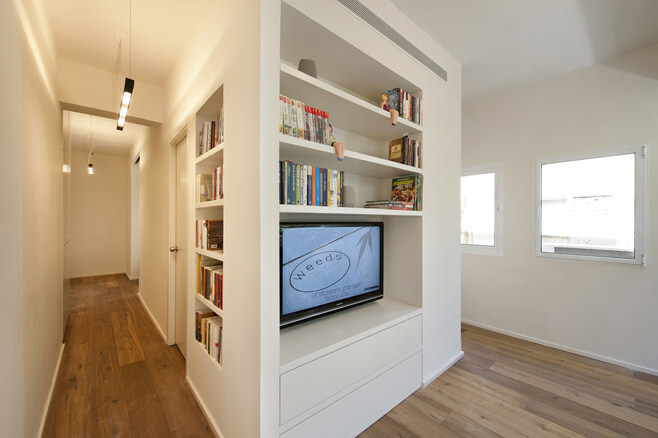 Most often in such situations, use partitions to delimit the space or furniture, but in this case, the designers decided to go a completely different way. The main idea was to arrange storage space.things in the center of the apartment. 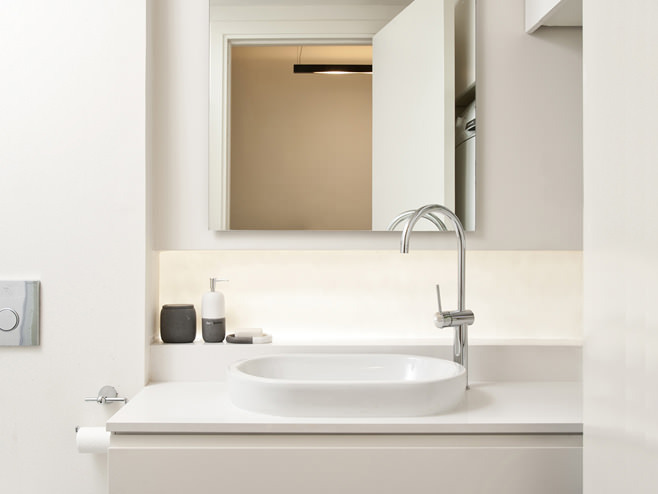 The bottom line is that cabinets, drawers and other furniture are located in the middle of the apartment in the form of a rectangular design in white. On the one hand, this figure is adjacent to the bedroom.zone. It turned out quite spacious. This was achieved thanks to the sliding door, which at the right time can turn this part of the room into a secluded corner. 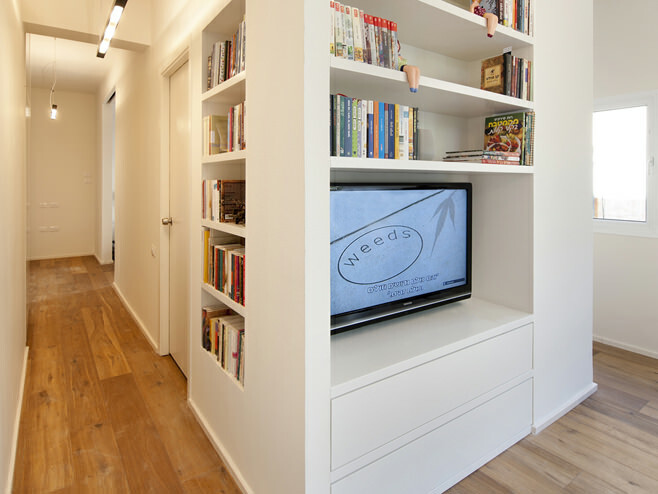 In the central area of ​​the living room is a TV, bookshelves and a chest of drawers. All this is built into the central structure, so there is a lot of free space. Kitchen is located on the opposite side.space. 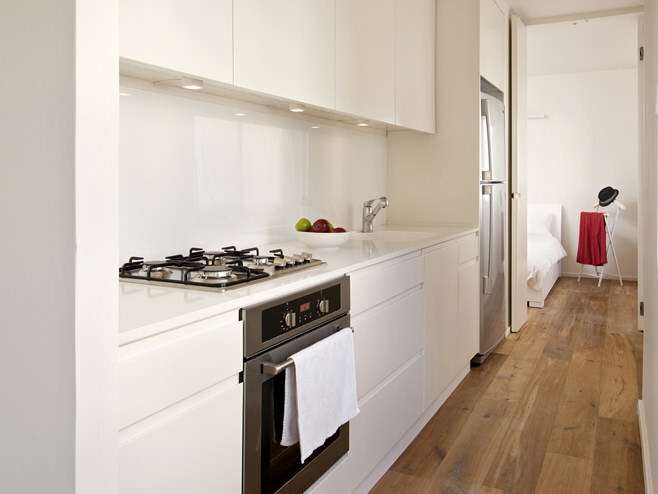 Everything here is organized ergonomically and comfortably, so the process of cooking will be quite comfortable. There is always enough light here, since this zone is located opposite three windows at once. 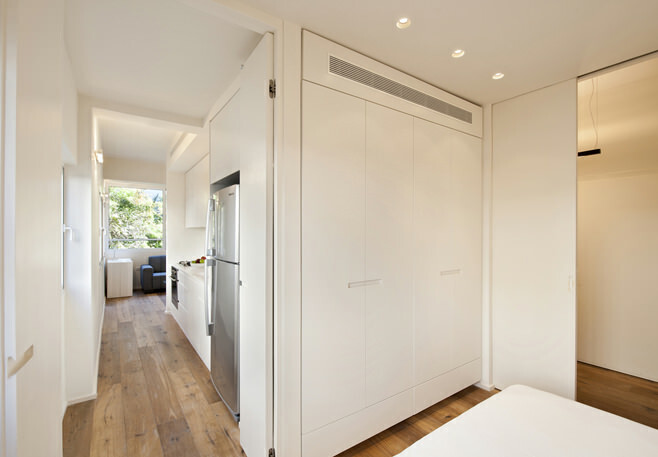 In this area, we managed to locate not only the stove and table, but also a roomy refrigerator. 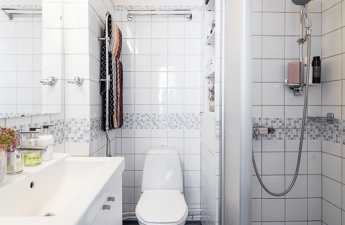 A bathroom and storage cabinets were built into the interior of the rectangle. 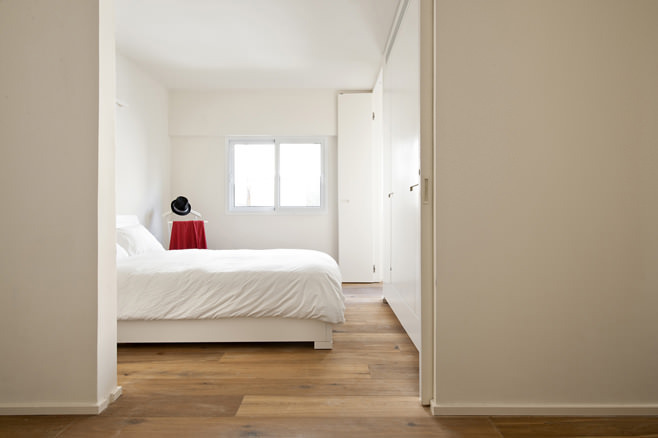 The whole interior after the conversion did notlook squeezed, because there is an opportunity to come from any side, and the absence of partitions visually adds additional volume to the room. 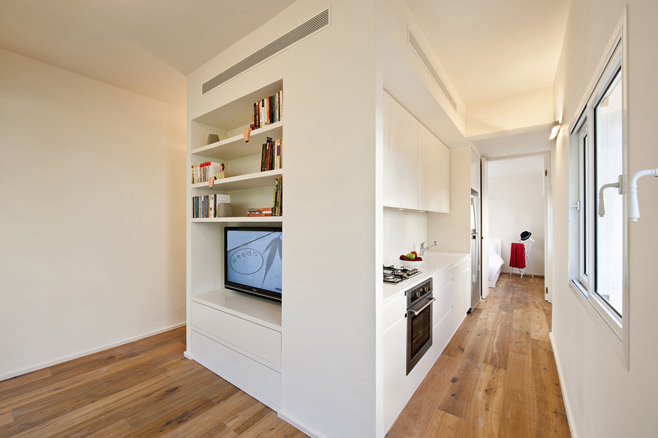 The floor covering serves as a unifying element, since it is uniform over the entire area of ​​the apartment. Therefore, the room looks even more spacious. 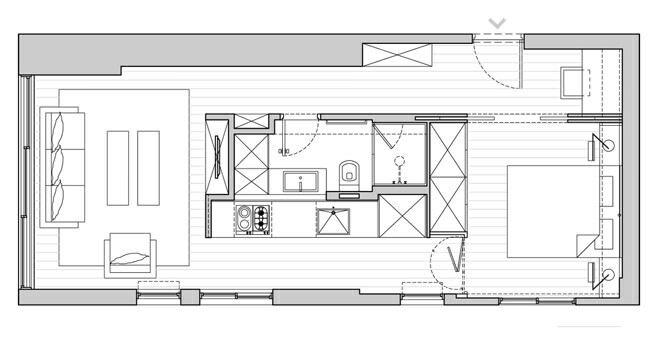 The original layout of the three-room "dvushki"